The event that would become Bixby Green Corn Festival started in 1947 as a simple, spur of the moment get-together to celebrate an especially good corn crop. Workers had kept a furious pace for weeks harvesting, packing and shipping sweet corn to customers all over the country. Clyde Miller along with the Baker Brothers, Louis & Cecil, were Bixby produce grower, buyers and wholesalers who shipped corn and other crops throughout the nation. As the harvest ended, it was time for a celebration. Miller and The Baker brothers, along with their families, and employees’ families, gathered at the rail shipping docks just northeast of downtown Bixby for an ice cream social. About one hundred people attended. The following year more area farmers and produce dealers joined the celebration. The festive activities extended to a full day of music, games and a picnic. In 1949 the celebration officially became a community wide event known as the Bixby Green Corn Festival. Bixby Chamber of Commerce joined sponsorship and moved the event to the city park in downtown Bixby. Over the next few years the celebration expanded even more. Local organizations and churches set up booths along barricaded Dawes Street to sell merchandise and food. The festival was officially opened with an all faith gospel sing-along held at the flagpole intersection the night before the celebration began. Festival activities included a parade, singing, games, live radio broadcasts, professional wrestling matches, a carnival, a street dance, contests and drawings for prizes. Local merchants donated prizes for the contests and drawings. Among the contests were hog calling, greased pig chasing, greased poll climbing, corn-on-the-cob eating, watermelon eating, pie eating, fiddle playing, banjo playing, yodeling, sack racing, terrapin racing and a pretty baby contest. 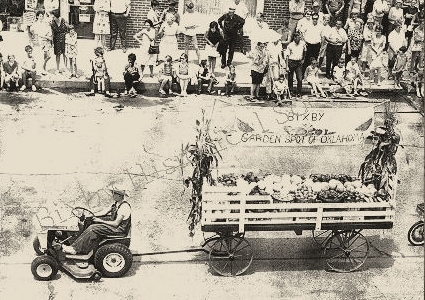 In 1953, approximately 8,000 to 10,000 people attended the Bixby Green Corn Festival. Festival activities for the following year were hampered by 110 degree temperatures and drought. 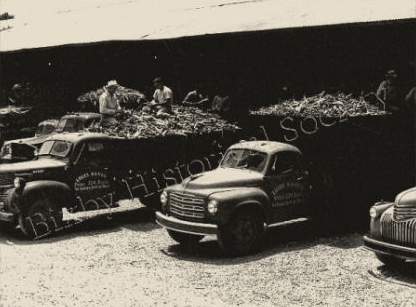 The severe drought that continued into 1955 prompted festival sponsors to cancel the Green Corn Festival in in favor of a fall festival honoring Bixby’s status as the Garden Spot of Oklahoma. Garden Spot Day celebrations were a huge success in the fall of 1955 and 1956. However, in the spring of 1957, Bixby and the surrounding area experienced the worst flood since 1923. Garden Spot Day was canceled as recovery continued through 1958. The area was slowly recovering when another major flood struck in 1959. Festival plans were indefinitely abandoned as resources and energy were directed toward restoration. In the spring of 1967 the newly organized Jaycee’s president, Cary Coppick, announced that after a twelve year absence the Green Gorn Festival would once again be celebrated in Bixby. Farmers, merchants,organizations and schools joined in to make the revival a success. That first year of the comeback, 6,000 to 7,000 people watched the hour long parade headed up by the Bixby High School Marching Band and Green Corn Festival Queen, Linda Mitchell. Entries included floats,area bands, round-up clubs on horseback, and politicians. A favorite crowd pleaser that year was a team of Belgium horses owned by Fred Cox. Activities included sack races, greased pole climbing contests, drawings for prizes, terrapin races, horseshoe matches, bingo, visiting and a talent show. Janet Butler won the talent show senior division with a vocal solo. Penny Marshall placed second with a piano number. The talent show junior division was won by Connie Browning, first place, and Tommy Foucht, second place. The Jaycee-ettes hosted food booths for the day. They sold over 750 hot dogs, 3,000 cold drinks and several hundred barbeque sandwiches. A wrestling ring was built on Dawes just west of the flagpole. That evening, approximately 3,000 fans watched as pro wrestler, Gorgeous George, wrestled for two matches. At the same time, Square dancing in the park drew a crowd of over 2,500. The Green Corn Festival of 1967 ended with a street dance to the music of Shipman Brothers Band. Bixby reclaimed The Green Corn Festival! The Jaycees continued to sponsor the Green Corn Festival. In 1968 the festival date changed to June, the beginning of corn season. Barricades were set up to block traffic on Dawes Street between the flagpole intersection and the city park. Jaycees, Junior Mulkey and Bill Young, set up lights for evening events. Johnny Lee Wills accompanied by Mayor L. C. Neel and Debbie Peters, the 1968 Green Corn Festival Queen, led the the festival parade that year. Willard Mills, Jaycee president, was master of ceremony. Throughout the day, drawings were held for eight large sacks of groceries from Docs’ Thrift-T-Wise and twenty cash prizes of $5 each. Added to the 1968 Green Corn Festival was a horse show. The show consisted of competition in elementary, junior and senior divisions of three classes, Western, Pleasure and Halter. The Shipman Brothers Band, Dale, Ronnie, Ray and joined by sister Nola, provided music for for the street dance that capped off the day’s events.